I’m excited to share this portrait drawing of Pope Francis made by my daughter. 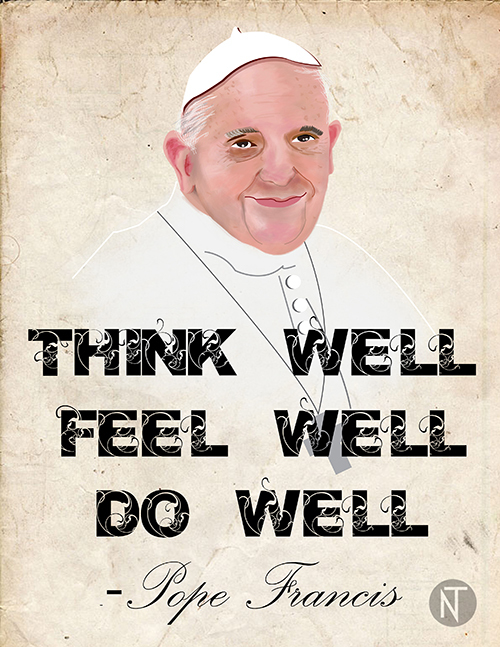 I requested her to place one of Pope Francis’ memorable quotes in the portrait. I hope you’ll like it and be inspired by the message. The pontiff was in the Philippines from January 15 to 19 for a pastoral and state visit. An uncolored version of this portrait (minus the quote) appeared at the January 15, 2015 issue of People’s Tonight editorial page. This entry was posted in Artwork, Inspirational and tagged Pope Francis colored sketch, Pope Francis portrait drawing, Pope Francis quote, Pope Francis sketch on January 22, 2015 by Yami. N’s watercolor painting practice. She made this “fruit platter” last summer (2014). 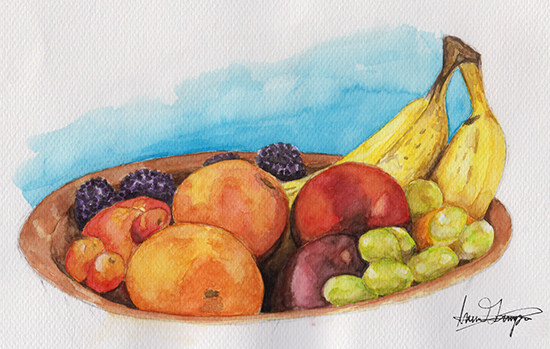 This entry was posted in Artwork and tagged fruit platter painting, watercolor painting on January 1, 2015 by Yami.